Clinton, Michigan - Eden Foods introduces five roasted and rolled North American small farm organically grown whole grains, Eden Organic Flakes. Eden Organic Flakes are hulled whole grain sprayed with pure water and gas flame roasted in a ceramic lined kiln. The roasted grain is rolled into flakes on stainless steel rollers. These methods preserve the whole grain nutrition while making flakes that are easy and extremely versatile. Each cooks in just 3 minutes. Brown Rice Flakes — Lundberg™ California short grain organic brown rice. Cooks into a creamy, mildly sweet porridge. Easy and enjoyable brown rice nourishment for a first solid food, for the very old, and for everyone else. Oat Flakes — Organically grown in Saskatchewan, "The best tasting oats since I visited Sweden" said Eden Purchasing Director Jon Solomon. Rich in fiber and thiamin (B1), a good source of iron and magnesium. Kamut® Flakes — Montana family farm organically grown. An ancient non-hybridized wheat with very large golden kernels. Often enjoyed by those who have sensitivity to modern wheat. Rye Flakes — Organically grown on small Nebraska family farms. A dark robust grain made into surprisingly mild and tasty flakes. Very high in fiber with a complete amino acid profile, including all the essential ones. Spelt Flakes — Organically grown in Michigan's thumb. Like kamut, it is an ancient non-hybridized wheat. St. Hildegarde wrote about spelt, "It produces a strong body and healthy blood for those who eat it and makes the spirit of man light and cheerful." A good source of dietary fiber, protein, thiamin (B1), niacin (B3), and magnesium. All Eden Organic Flakes are low fat and sodium free. They offer a quick and easy way to enjoy a variety of whole grains. Eden Organic Flakes are roasted and rolled in Nebraska and packed at Eden's Clinton, Michigan AIB 'Superior' rated facility. They are packaged in one pound (16 ounce) easily merchandised, reclosable standing pouches with recipes. Each is nitrogen flushed for freshness. kosher pareve. Eden Organic Flakes are perfect for quick hot breakfast cereal, in baked goods, homemade muesli and granola, and confections. They are ideal for hearty soups and on salads, and even for making wholesome entrées. Visit www.edenfoods.com/recipes for some great free recipes. The USDA Dietary Guidelines for Americans recommends three whole grain servings a day. In order for a food to be called 'whole grain' it must contain all of the grain's edible parts: the bran, germ, and endosperm. The FDA recognizes whole grain benefits in the approved claim, "Diets rich in whole grain food and other plant foods, and low in total fat, saturated fat, and cholesterol may reduce the risk of heart disease and some cancers." 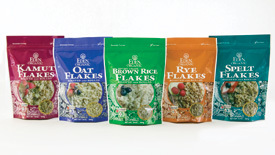 All Eden Organic Flakes are 100 percent whole grain food, with nothing taken away or added. A major study published in the Archives of Internal Medicine, yet again confirmed the critical role of whole grain to health. "Eating half a cup to a cup of whole grain breakfast cereal may help lower your blood pressure. It may help lower your risk of diabetes and heart disease," said the research leader, Dr. Luc Djousse of Brigham and Women's Hospital and Harvard Medical School. "This study adds another piece to the puzzle. It may also lower your risk of heart failure."